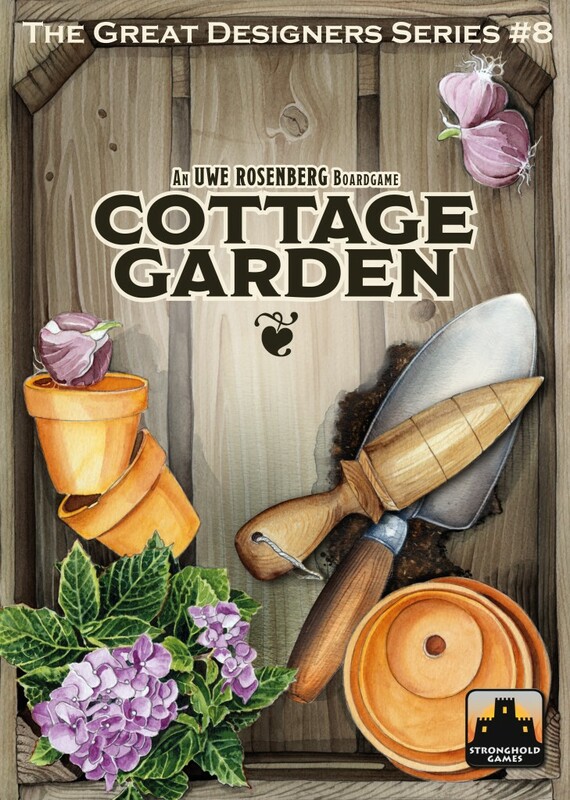 Cottage Garden is a pattern building and tile placement game, and is the eighth game in Stronghold Games’ “Great Designer Series”. The game has three main elements, first off are the flower tiles. The tiles each have an irregular pattern, that players will use to try to cover empty portions of their flowerbed cards. This brings up the second element, the flowerbed cards. Each player gets two random flowerbeds, with an additional non-player card that rotates into play when a player completely fills their current card to score it. The final element is the game board from which tiles will be selected. A die moves one space ahead each turn, traveling around the outside of the board. The active player gets to select a single flower tile from the row or column that the die is on, and put it into either of their flowerbeds while attempting not to cover up any scoring elements on that card. When a flowerbed card is full, points are earned, the card is flipped over to reveal a different flowerbed, and swapped for the flowerbed card that is not currently in play. The spent flower tiles are eventually cycled back into the available choices in future turns and any non-flower tokens (like cats and flowerpots, neither of which I’ll get into here) are returned to their respective piles. The die that is used to determine what tile options can be chosen also functions as a countdown tracker. When it reaches 6 players discard any flowerbeds that don’t have at least three flower tiles on them and will actively lose points each turn until they are able to complete any flowerbed cards still in play. I love how the endgame process works in this. Not only does it discourage stalling tactics in the middle of the game, but it actively penalizes them at the end by removing more points each turn than a player would gain. Cottage Garden is based on the two-player game Patchwork, in which you are using similarly irregular tiles to create a patchwork quilt. It uses several of the same mechanics but adds some additional options that both speed up the game and increases the strategy. The other nice thing about Cottage Garden is that it is playable as a solo game, or by up to four players, rather than just two. If you enjoyed Patchwork (and most people who have tried it, do), odds are good you will absolutely love Cottage Garden.